Police flashlights, as the name says, is for police used. But that was before because everyone can own a police flashlight. Unlike a police gun, you don’t require a police license just to acquire a flashlight. Flashlights are a necessity and if you are a person who has a gun, then carrying a torch won’t definitely hurt. With the many police flashlights today, it is overwhelming to choose one that will suit your needs. A police flashlight does not necessarily mean that they are for law-enforcement use only. As mentioned above, they are for everyone, and they can also be used for different purposes. The flashlight can improve your vision especially during the dark or when you’re out hiking or camping. So without further due, I will be discussing below the top 10 best police flashlights that you can choose from. Get to know each one of them by reading the information provided for you below. The SureFire G2X flashlight is compact and is perfect during nighttime shooting. It has a maximum brightness where the total lumens is at 320. You can carry this flashlight with you quickly because of its lightweight. The SureFire G2X is made out of an aluminum casing and a soft covering of Nitrolon to ensure durability and comfort. 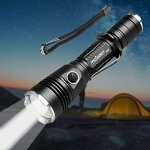 It is also impact resistant and weatherproof, which will make sure that this flashlight will last for an extended period of time. The Orcatorch T20 Tactical flashlight is equipped with a total of 980 lumens when it is used at its highest setting. It has a strobe function which you can use during emergencies. There is also an SOS alert, which can help emergency personnel to track you during emergencies. When using this flashlight on its highest setting, the battery can handle it. Once the battery runs out, you can just charge it since it rechargeable, so you don’t have to worry about anything. This Orcatorch flashlight has a total of 980 lumens, which can help you see the path that you are walking on. It has strike bezels which can be used for self-defense. 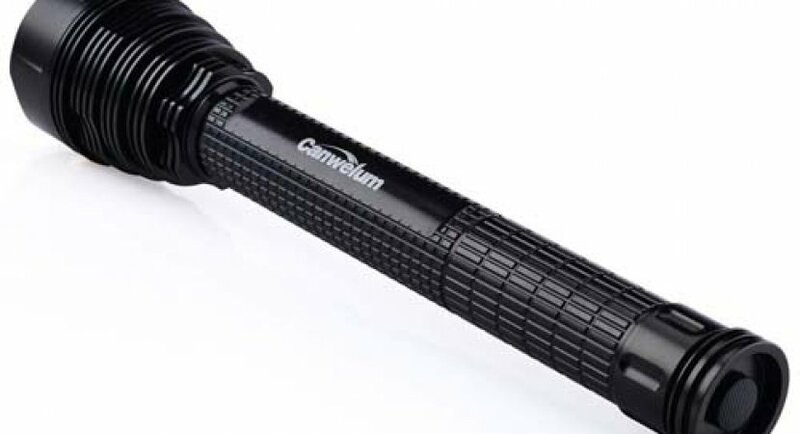 To ensure its durability, the casing of this flashlight is made out of high-quality aluminum. With its lightweight and compact design, you will surely be able to bring this flashlight with you anywhere. The Smith Wesson M&P 110215 MP 12 flashlight has a lightweight and compact design. You can easily install it on your handgun or on your rifle if needed. This flashlight provides a maximum lumen of 875 and can last for up to four hours. It also has the power to illuminate a total of 242 meters. 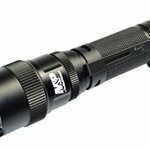 The lens of this flashlight is anti-reflective and shatterproof, which means that it is durable enough and can withstand impact. This Smith Wesson M&P 110215 MP12 flashlight is equipped with strobe options which you can use for your emergencies. Lastly, this flashlight is impact and water resistant, which makes it perfect for outdoor use and definitely for police use. The Pelican 7600 rechargeable tactical flashlight comes in white, green and red color options. It is made out of durable aircraft aluminum casing, which means that it will last for an extended period of time. The maximum lumens of this flashlight is at 944, while the battery can last for a total of 24 hours when used on a high setting. This flashlight is using a lithium-ion battery that can be charged using a USB. The flashlight has a battery indicator so you should know if it’s already running low on battery. This Pelican 7600 flashlight is submersible and is fully waterproof. It also has three brightness levels for your needs, especially when working in the dark. One of the best things about this flashlight is that it is shockproof which is perfect for law enforcement. Lastly, the flashlight has a soft grip which makes it more comfortable to hold. The Guard Dog Security Icon Waterproof Tactical flashlight has a total of 900 lumens. 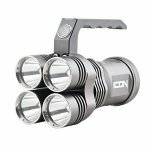 But since it has four flashlights in one, this just means that this can provide you with a maximum of 3000 lumens. But despite the number of the flashlights, it is still compact and easy to handle, which is perfect for law enforcement. This Guard Dog Security Icon flashlight is powered by four rechargeable batteries. It also has a battery indicator so you will be notified if you’re already running out of battery. This flashlight also has a strobe option which is perfect for emergencies and even during search and rescue operation. The NiteCore R25 flashlight can give you a total of 800 lumens when used on its highest setting. The batteries are rechargeable, so you don’t have to purchase often. It also has a smart dock so you can put it in your car or a wall for easy access. The design of the flashlight also has a comfort grip and as well as an anti-roll head. The Nitecore R25 is submersible since it is waterproof, which means that you don’t have to worry about accidentally dropping it. The total beam distance of this flashlight is 351 yards so you can see your path clearly. Lastly, it is impact and shockproof which makes it perfect for law enforcement. 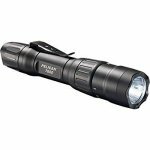 The Streamlight 75813 comes with a maximum lumen of 385, which is perfect for people who are not looking for too much brightness. It can last for a maximum of 7 hours when fully charged and uses a DC/AC connection. When it comes to the beam, it can be adjusted depending on your preferences. This means that you can widen it so you can get a lot of peripheral vision. 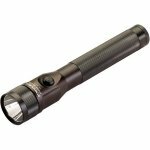 One of the best things about Streamlight 75813 is that it has an aircraft aluminum casing which is durable. There are three brightness levels, which includes a strobe option for emergencies. The lens is made out of polycarbonate which makes it extremely unbreakable. Lastly, all the materials used are water resistant. The Streamlight 74751 Strion flashlight is perfect for people who are patrolling. It is comfortable to hold, which means that you can handle it for an extended period of time. The switch is used to change the light mode to strobe, high, medium, and low. This flashlight has a maximum lumen of 500 and can last for an hour. 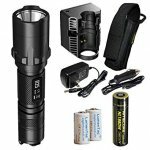 It is powered by a lithium-ion battery which will last three hours when you’re going to use your flashlight in its lowest setting. With is anodized aluminum casing, your flashlight will surely be durable and can withstand impact and as well as water. Lastly, it has a charge indicator to let you know if it’s already done the charging. The SureFire Defender Series LED flashlight is compact and can provide a lot of illumination. There are two available settings, which are the ultra-dim and the bright one. The higher setting will provide you with a total of 300 lumens, so you will be assured that you will be able to see everything that’s in front of you. You can easily switch the levels easily with the button that is placed at the rear of the flashlight. 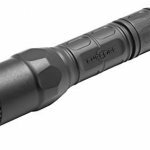 This SureFire Defender Series LED flashlight is made out of anodized aluminum frame which makes it durable. 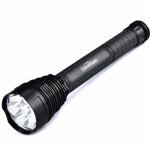 One of the best things about this flashlight is that it can also be used for self-defense because of the strike bezel design that it has. Lastly, this flashlight is using CR123 batteries for long lasting usage. The Streamlight 75458 is powered by a high-performance battery that has a lifespan of 50,000 hours. It can be charged for up to 1,000 times. You can use one of the four different illumination levels, including high, medium, low, and strobe that you can use during emergencies. The battery can last for an hour if you’re going to use the highest setting. This Streamlight 75458 is made out of anodized aluminum which makes it durable and perfect for law enforcement use. It is also impact and water resistant. Lastly, for additional comfort, the grip is made comfortably especially for extended usage. A police flashlight is designed for police and military as the name says. There are a lot of police flashlights that are designed to be used and mounted on a weapon, especially for low light shooting. They are usually smaller than your typical traditional flashlights but has the power to emit more light. They are also made out of weapon-grade aluminum to ensure that the flashlight has maximum durability. Yes, police flashlights may be for police and military, but any other civilian can very much carry this kind of device. Two of the first things that you need to consider when purchasing a police flashlight are the weight and size. Police flashlights are used as a backup weapon and something that can help you during operations at night. There are big size police flashlights that you can use to light up a path and something that can handle a self-defense tool. You can also get a small size with strike bezel to still protect yourself against attackers. You need to take into consideration how your police flashlight can help you during emergency situations. There are compact units that can be carried easily for an extended period of time. 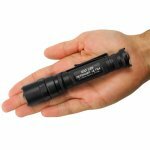 These types of police flashlights can fit in your pocket or on your belt, which can be a good choice. Police flashlights need to be brighter than your usual flashlights. The reason behind this is because the brightness can blind the suspects temporarily and this is for your safety. You need to choose a flashlight that can produce a minimum of 800 lumens especially if you’re going to use it for patrolling purposes. Now, if you need the flashlight for camping or during power outages, then choosing 500 lumens would be perfect. There are two types of batteries, which are the disposable and the rechargeable ones. It is always better to get a rechargeable battery because it will be cheaper in the long run. You don’t have to replace them as often as possible, and all you have to do is to charge them when needed. Most police flashlights are using CR123, and you have the option to upgrade to the rechargeable versions. They may be initially expensive, but you will be able to save in the long run. The battery life of your flashlight is also essential, especially during operations. You need to check on the batteries if they easily drain once you turn on the flashlight or not. When choosing a flashlight, it would be best to pick LED ones as they don’t drain batteries that easily compared to traditional flashlights. Put in mind that the higher the flashlight’s intensity, the short the life of the battery. The reason behind this is because the battery is exerting more energy than when it is when you’re using the flashlight at its lowest setting. You may also opt for NiCad batteries as they provide an excellent flashlight output and a useful lifespan. They have the power to light up for several hours before they start to fade. The Lithium ones are powerful when it comes to higher lights. They may be expensive, but they will provide you with a longer lifespan. Another thing that you need to have when it comes to a police flashlight is to have a strobe. The strobe light can help alert others of your current position or blind your suspects. This is essential if every police flashlights so always make sure that it has a strobe function. You should also check the ruggedness of the police flashlight that you’re going to purchase. Since police flashlights are often used during operations, there will be instances where you can accidentally drop them during a chase. If this, your flashlight should still be working fine. The best thing that you can do is to choose a flashlight that is composed of high quality and durable materials. It also has drop protection or impact protection to keep your flashlight safe from drops. Lastly, you need to choose a police flashlight that you can easily mount on your weapon. This is a good thing because you will need minimum manipulation when it comes to the flashlight. All you have to do is to flip a switch, and your flashlight will be turned on, and you can use your gun to shoot if needed. If mounting is not needed, it would be best just to separate it from the weapon to avoid accidents and such. Lastly, you need to take into consideration the budget that you have for the police flashlights. 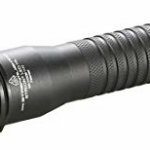 With the list above of the top 10 best police flashlights, they come at affordable prices, but there are some that are quite expensive. If you want a good police flashlight that will last long, then you should ensure that your budget should be a little higher than usual. Cheap flashlights don’t have the durability that you need when the action comes in. One of the first things that makes a good police flashlight is its size. Since you are going to use it for operations, or to mount on your weapon, you need a small flashlight. Small flashlights can also help you to carry it anywhere comfortably you are without worrying about its size. Another thing that makes a good police flashlight is one that has at least 120 lumens. The reason behind this is because this number of lumens is already enough to help you disorient your attackers. Anything that is less than 120 lumens might not be effective in blinding your attacker temporarily. There are a lot of police flashlights that are equipped with SOS and strobe functions. This can help you change the brightness when needed. With police flashlights, you don’t actually need to have all the features because they are already bright enough to do the work that is needed to protect or help you. Of course, having a flashlight that is waterproof will help you in every situation. You can use it when it’s raining or when you accidentally drop it in the water. Always make sure that your police flashlight is waterproof in case of emergencies or wet weather. Of course, another thing that will make you police flashlight the best is by choosing one that uses LED. The reason behind this is because LEDs have a long lifespan and are more durable compared to traditional bulbs. Incandescent bulbs are not as durable as LED since they easily break once you drop them. They are also not energy efficient. Using police flashlight with LED will make sure that your flashlight is durable enough and will ensure that the light will last longer. Your police flashlight should be durable enough to withstand any impact and all the actions that you might come across. As mentioned above military materials would be best and as well as hard anodized aluminum. It may be a tough kind of metal, but it is very light and can easily be gripped. This also means that you don’t have to worry about dropping it because of the anti-slip feature that most police flashlight has. With all of the top 10 best police flashlights above, I have undoubtedly helped narrow down your options. The features mentioned and the pros and cons will help you choose the one that you actually need. 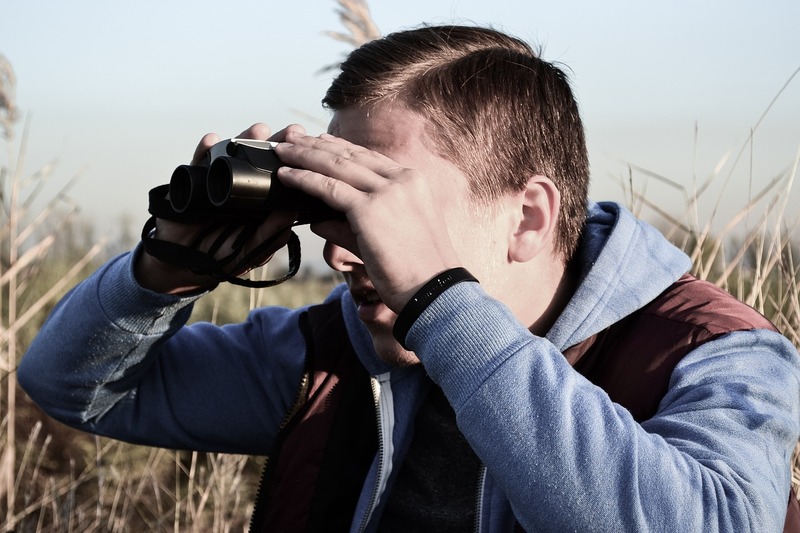 Make sure to follow the tips above on the things that you need to consider and the ones that make a good police flashlight so you can get the most out of your money. Remember that getting a police flashlight is not only for police or military use but also for civilians’ use. Choose the best police flashlight for you today to have something that can help you run in the dark and with your other activities.